Adam Smith gave four taxation maxims in The Wealth of Nations that have been largely forgotten today. Taxes should be fair, non-arbitrary, cost-effective and convenient. Adam Smith gave four maxims on taxation that are integrated into our proposed economic system. "The high price of necessities for the poor must be compensated by an increase in their wages.. It must always be remembered, that it is the luxurious and not the necessary expence of the lower class that should be taxed." 2: The tax which each person pays must be certain and not arbitrary. This maxim applies to the valuation of certain taxes, such as land taxes. "A land-tax assessed according to a general survey and valuation, however equal it may be at first, must become unequal after some time.. The tax is regulated by the discretion of the intendant of Montauban and is arbitrary." 3: Every tax should be levied at the time and manner most convenient for the taxpayer. "The importers are always subject to the custom-house officer’s visit and examination, and obliged to justify by proper certificates the payment of the duty on the goods in their shops or warehouses. The excise-duties on imported rum are presently levied this way. The same system of administration might be extended to all duties on imported goods, provided that those duties were like the excise duties." 4: Taxes should take out as little as possible from the people over and above what it brings into the public treasury. "The gabelles, aides, traites, domaine, and tobacco taxes are collected in most of the provinces. These are much more wasteful and expensive to administer." We use these maxims on current taxes to see if they pass. This will then determine whether the tax is just or if it needs to be revised. In this example, we will apply it to income taxes which are assessed according to 'tax brackets' and exemptions, by running four tests. Test 1: Is it proportional to the ability of the person to pay? 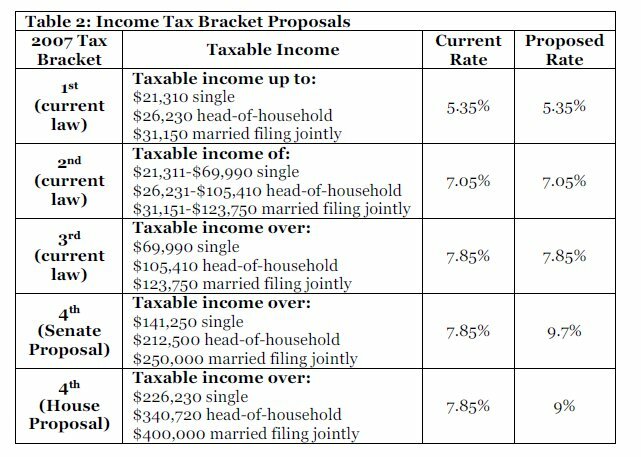 The income tax in this case is progressive -- the rate increases with the increase in the base taxable income. So it somewhat passes the first test by allowing the less-able-to-pay pay less. However, it is uncertain whether such a tax rate would be really fair because there is no information on the socio-economic conditions of the people being taxed. Test 2: Is it certain and not arbitrary? Since the amount to be paid can be arrived at clearly by using the table, this tax passes the second test. Test 3: Is it convenient? The convenience of the tax in this case is not so perfect since, just from the information given, it is evident that computations must be done and that the filing requirements might cause added burdens to the taxpayer. Test 4: Is it cost-efficient? Since there is no information on the costs on collecting this kind of tax, we cannot run this test objectively. However, the advances in technology generally allow taxes to be administered via the internet and be paid via electronic bank transfers, reducing the cost in manual labour in the long run. This idea of putting taxes and economic policies through a standardized test is inspired by unit testing in software development, wherein code is tested to see if it meets certain criteria. Using this system, various tax policies can be put through the test to see pass or fail more easily.